On Friday I had one of those ideas that if I didn't blog about it straight away, I knew it would never happen. I thought about it for a further 2 seconds and then decided to be brave and put my idea out there, and so the Butterfly Challenge was born. It was such a spontaneous post that I didn't have the time to think through all the details. This is the promised follow up post with all the things that I didn't get the chance to say. The challenge revolves around my two butterfly patterns (the 12 inch Butterfly and/ or the simple 5" butterfly). Show me your interpretation of the block. Make it as unique as you can.You can alter the pattern (like I did making the wonky log cabin butterfly shown above); you could use fussy cut fabrics; you could alter the scale, you could make a whole family of butterflies; you could use your quilting to embellish the butterfly- ah the possibilities are endless! I was tempted to illustrate this post with a few of my ideas of what you can do with the pattern, but I decided not to. This is about your ideas and inspiration after all- not mine! I have reduced the price of these patterns in my Craftsy store until 10 August NZT (remember we're ahead of the rest of the world in New Zealand). If you prefer to buy through Etsy, the coupon CHALLENGE will give you 33% off your purchase. until 10 August. Share your butterflies in the linky at the bottom of this post, which will be open until 8:00pm on Sunday 31st August (NZT). You don't have to have a blog to enter, flickr pictures are also totally acceptable. 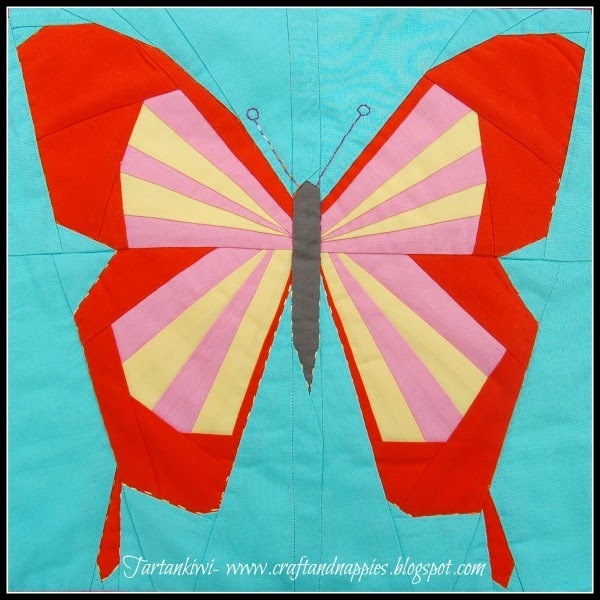 During the month of August, I will post a paper piecing tutorial and also show you how I altered the basic butterfly pattern to create a log cabin butterfly. If there are other things that you want to learn, please let me know sooner rather than later as these kind of posts take time to create. A few of you may be wondering whether or not this pattern is suitable for people new to paper piecing. I would say yes. I have taught the 12 inch butterfly to beginners with great success. It may have quite a few pieces, but there are very few nasty angles and there are ways to cheat and make these easier! Take it slowly, don't cut your fabric too small and you'll be fine. If you want to share your progress on instagram. 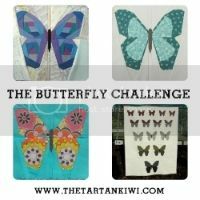 Use the hashtag #tkbutterflychallenge and feel free to tag me @tartankiwi. I really can't wait to see what you all come up with! Each person can enter up to two times. Each entry must have its own post which links to the Butterfly Challenge and/ or include a Butterfly Challenge button..
One of these two entries may be up to 3 months old, the other entry must be new for the challenge. Finished items are nice but not essential, finished blocks will also be in the running to win prizes. Now after all the boring stuff, I guess you want to know about the prizes. As I said before, I started this on a bit of a mad whim, so the chances are that more prizes will be added as the month goes on. That said, I'm super excited about the prizes that we have at the moment. The first prize (which will be chosen by me) is an Oakshott Cotton Fat Eighth Lipari Bundle. Eighteen fat eighths of Scrummy Oakshott Cotton- ah the possibilities! The second prize (which will be chosen by my 5 year old daughter Rascal) is an Oakshott Cotton Fat Eighth Ruby Bundle. Sixteen fat eighths of Oakshott cottons which all share a red warp thread. I must admit that I am seriously tempted to try sewing my Little Bear Pattern with this bundle! 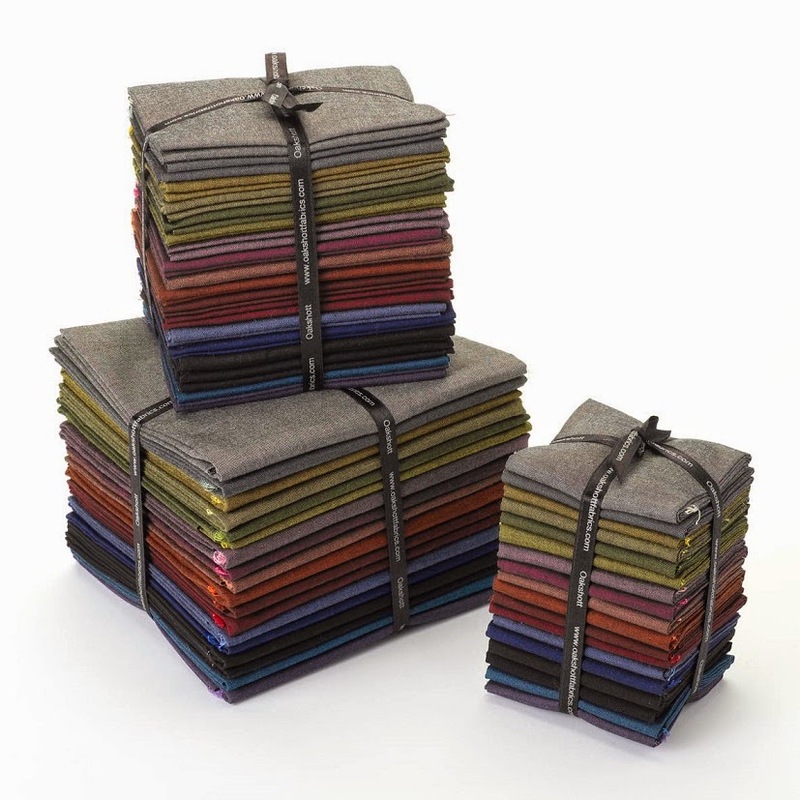 A Fat Eight Bundle of Oakshott Cotton Lakes.The wonky logcabin butterfly shown above was made with scraps of this bundle- all the fabrics share a blue warp thread and they are absolutely beautiful! The final prize is your choice of three Tartankiwi Patterns (this can include the as yet to be published Big Bear pattern if you like). I'll also have a wee look through my stash and see if I can find a nice little something to send to this winner. The linky will close at 10pm on 31st August (NZT). PLEASE PLEASE PLEASE remember that New Zealand is ahead of the rest of the world. We are 12 hours ahead of the UK and even further ahead of the States so please don't let time zones make you miss the deadline! So there you have it! I hope you'll join in the fun. I can't wait to see what you all come up with. Please help spread the word- the more the merrier don't you think?! oooooooo Juliet! i think my arm may just have been twisted off! Awesome prizes!! Looks like fun!! And those prizes look amazing too! I'm in, such sweet prizes, I just got my pattern and so many fun ideas running through my head! I just bought the patterns.... Idea for my mum's birthday! oh man I just remembered this! better add it to my todo list!!! Very tempting - will think on it for a day. Some little ideas brewing away. 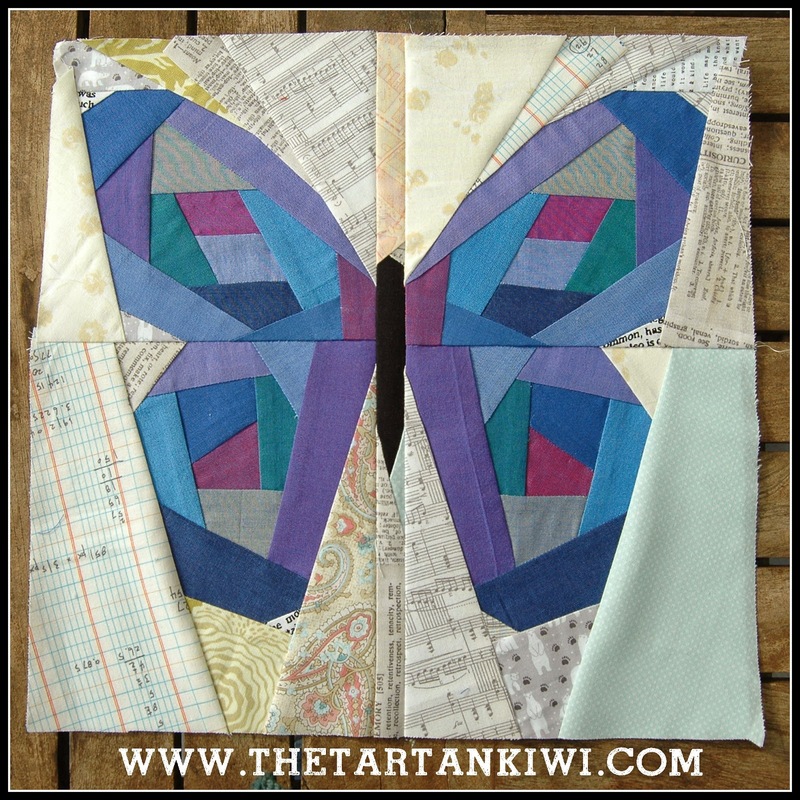 Thankyou for the marvellous challenge - I totally adore the butterfly I created!